Few were doubting that the Soviet Union would grab one of the two berths for Italia'90 from qualification Group 3. But which nation would join them? Was it finally time for East Germany again to progress to the World Cup finals? Their hardest opponents looked to be Austria, last participating in 1982, who frankly hadn't shown too many promising signs over the last few years. Iceland and Turkey were not rated as contenders to qualify, but were known to be able to cause problems for most teams in individual fixtures. It looked to be a relatively open group behind the Soviet Union. Read more . . .
Low-paced game played on a difficult pitch. Iceland should've been further ahead by the time when the Soviets got their equalizer. Both sides probably fine with a draw in the end. Turkey got their qualification under way, but despite being dominant for large chunks of the game against a depleted Iceland side, they were unable to gain the win which they had been looking for to kick-start their campaign. Tanju, a prolific scorer at domestic level, missed a late first half penalty, and the hosts would need to come back from a goal down to save a point. On a difficult surface, the hosts run out deserved winners even if they struggle to maintain their top level throughout. However, when they are turned on, they are far too good for a defensive Austrian outfit, which clearly had come to Kiev with a plan to sabotage the hosts' attacking play. After Mikhailichenko's early second half goal, there was only going to be one outcome, and the visitors' youthful select never managed to trouble Dasayev. The East Germans got their qualification campaign rolling through a fine home win against an Iceland which had earlier recorded two draws. The manner in which it happened would've most likely pleased manager Bernd Stange, as they'd mostly dominated the visitors, and kept a clean sheet in the process. Super forward Andreas Thom the hero with two well-taken goals. Iceland had defender Sævar Jónsson sent off in the second half after pushing Ulf Kirsten. They did not manage to put new first choice 'keeper Jörg Weißflog to the test, and lost deservedly. Austria see midfield legend Herbert Prohaska back after three and a half years away from the national team, and from the deep midfield role, he plays one of the leading roles in the hosts' win. Yet, it is starlet Andy Herzog who catches the headlines with his two strikes from the edge of the area to see the Austrians into a flattering 3-0 lead. Turkey had relegated Tanju to the bench, and they were often toothless in front of goal, despite some early promise. Forward Rıdvan would always be a threat with his constant running into the channels, and he would be rewarded with two assists. The hosts did just about enough to win, even if there were some late nerves. Turkey gain their first win of the qualification with a fascinating performance in which they overpower their rather stale opponents. Tanju is the big hero with his two goals, but there's a host of fine individual performances in a sparkling Turkish select. East Germany did not really turn up for this game, and their talismanic captain, Thom, struggled despite scoring their consolation goal. This certainly opens up for an interesting 1989 for Group 3. A win best described as 'smash and grab' by the Turkish, who probably profitted from East Germany losing their influental midfielder Pilz early on. Tanju scored his fourth goal of the qualification, and would set up his front partner Rıdvan for a second right at the end. Inbetween, the Turkish had to endure some heavy GDR pressure. The hosts missed a few decent opportunities, and also saw Lindner's penalty on the hour saved by the excellent Engin. Tremendous result for Turkey, who go top of the group. Out of form and with a number of players injured, Zapf's team is an easy prey for the Soviet Union. The hosts have too much quality and punish any weakness shown by the visitors. Yet, Lobanovsky can surely not be happy with all about the performance: Their build-up play can be horribly slow and laboured, and everything seems to be channeled through the congested middle (focused on the playmaker Zavarov), to the total neglect of the wide areas. There's improvement in the 2nd half, however, with more tempo and fluidity. Few if any positives for East Germany, who weren't expected to take a point anyway. Having disposed of GDR two weeks earlier, the Soviets climbed into sole leadership with a hugely professional performance in difficult surroundings. They gradually came to terms with the hostility, and gained confidence to exert plenty of first half dominance on the hosts. This resulted in an almost inevitable opening goal after a well worked combination between Protasov and goalscorer Mikhailichenko. After the break, Turkey changed their approach tactically, though even if they huffed and puffed, they could never break the visitors down. In fact, chances at the other end were greater in numbers as well as in danger, and it took a fine display again by Turkey 'keeper Engin to keep the scores down. In a game which had been billed as a 'must win' one for the hosts, Austria went in front just after the two minute mark through a composed finish by their leading striker Toni Polster. The hosts had a good few players back from injury who had missed out on their trip to the Soviet Union, and after a poor opening 20 minutes, they would gradually seize the initiative. The Austrians defended in numbers, and their 5-3-2 appeared a good foil for the hosts, who were unable to break through. East Germany would eventually be rewarded for their second half superiority with four minutes remaining, although they were a tad fortunate to still be in the game, as Polster had missed a gilt-edged opportunity on 66 minutes. The Soviet Union had been expected to continue their march towards group victory at home to lowly Iceland, though in a disappointing game they failed to live up to their favourites tag. The absence of midfield maestro Mikhailichenko could go some way to explaining why their performance remained dire, although they were unfortunate not to go in front when Protasov struck the underside of the bar on 15 minutes. It would need a set-piece to open the scoring, when Dobrovolsky struck home in the second half, but after more uneventful play, the visitors stole a point as they took advantage of a set-piece themselves, and saw substitute Áskelsson steal in at the far post to volley home. It had been their sole purposeful attempt all match. Iceland fail to make their dominance count against an Austrian side clearly content with trying to soak up the pressure and take a draw back home. They should've been made to pay for their defensive approach, as Sigurvinsson and Grétarsson on two occasions each should've scored. There was also a goal dubiously disallowed for Iceland captain Eðvaldsson towards the end of the first half. For the visitors, Herbert Prohaska, given the captain's armband for the occasion, completed his final ever match at senior level, and was one of their better players. Both sides still in with a chance to qualify for the World Cup, but the result would've felt like a kick in the teeth to the superior hosts. It is an important match for both sides, as they are eyeing up second place. Austria have moved the fixture away from Vienna due to an ongoing festival in Salzburg, something which could prove to be an inspirational setting. The first half has a lot of stops, with players in need of treatment, and both sides eventually manage to line up a couple of decent goalscoring attempts. Goals arrive after the break, though, and local boy Heimo Pfeifenberger comes good as he scores on his debut early in the half. Ragnar Margeirsson immediately levels the score as the hosts switch off. Then Manfred Zsak restores their lead with a tremendous strike. Iceland do not manage to conjure another equaliser, and so Austria are in pole position before the final matches of the group. Both camps had seen a point's return from this fixture as precious, and so the game followed a pattern where this outcome became increasingly inevitable. There were a couple of opportunities either way, although the hosts failed to even test Chanov throughout, while Lindenberger was equal to second half shots from Cherenkov and Litovchenko. Before the break, Protasov had struck the outside of the post in what had been one of the best moves during the game. Other than that, this was a dull, tedious affair. On a cold, wet Reykjavik afternoon, the hosts are rocked by several defensive absentees, something which will haunt them during a game where they fail to display their usual aggression. The visitors seize on the opportunity to restore some confidence to their team, as they quickly gain control during a goalless first half. Iceland do have available to them again Guðjohnsen, but the Anderlecht ace is unable to make a difference on this occasion, and departs shortly after GDR have moved ahead. Three goals in quick second half succession ensures an easy passage through to full time, and the dominant away side even miss a late penalty through ace forward Doll, who had played a big part in all three goals. Thoroughly deserved away win. Iceland were completing their qualification with a spirited showing against an opponent which was chasing at least a point to take back home in their quest to reach the World Cup. Under temporary charge from Sigfried Held's assistant Guðni Kjartansson, Iceland looked enthusiastic early on, but struggled in the severe wind towards the end of a goalless half. Returning striker Pétur Pétursson struck twice in the space of 15 minutes in the second half to boost their chances of securing a first win in the qualification, though they needed Bjarni Sigurðsson in inspired form down the other end. Turkey pulled a late goal back, and then had a long distance effort smashing off the bar. The visitors would've felt disappointed to leave with a defeat, but their performance had left a bit to be desired. The East Germans needed to follow up their win in Reykjavik with another two points, but against fancied opposition they knew they were in for a much harder task. The Soviets had arrived on the back of their draw in Austria, and were well aware that a point could be enough to see them through to the World Cup. They came with a defensive game plan, and they appeared to be playing it out for a stalemate. The first half saw no threat from either side, though after the break, the hosts were the better side. They had someone taking charge of midfield in Matthias Sammer, who possibly had his best international to date. However, it was the visitors who scored on a rare break, as Litovchenko's blockbuster almost broke the net. Two goals in quick succession through Thom and Sammer secured a precious two points for GDR, though, as they continue to hope for World Cup participation. The visitors got what they deserved. For this showdown, Turkey had switched over to Galatasaray's stadium, and they seized on their early advantage as they went in front on 15 minutes through a fine (and rare!) Rıdvan header. The speedy forward was back after having missed the trip to Iceland, playing up front with Feyyaz. The Austrians did have their first half moments, but they failed to truly test Engin, apart from Weber's tenth minute header from close range following Herzog's right wing corner which the 'keeper managed to tip over. The second half saw two further home goals, as Austria left big pockets of space following their switch to three up front. Three Turkish key players were yellow-carded, and are subsequently suspended for their final qualifier to marr their afternoon. 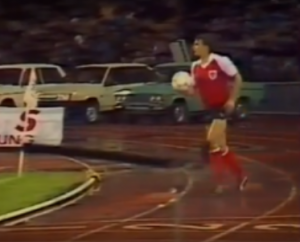 Austria now need to win against East Germany, hoping that the Soviets do the business against Turkey at home. Coming into the game, the Turkish had a chance to truly upset the odds and win the group. However, they needed something akin to a miracle in Simferopol, as the Soviets had yet to lose a qualifying tie on home soil. And without three key men, they rarely looked like breaching Dasayev, perhaps a second half Rıdvan free-kick apart. The hosts were in control of possession for most of the game, and had come close a few times in the first half through Mikhailichenko, who was part of an exciting central midfield three. It took them until halfway into the second half to open the scoring through Protasov, who finally again looked interested after some poor performances. There was never really any doubt as to where the game was heading after that, and they added a second on the break. Coupled with events elsewhere, Turkey were out. The Soviet Union had gone on to win the group. Austria delay their best performance of the qualification until when it mattered the most. They tore into the visitors from kick-off, and were ahead before two minutes had gone. Polster struck his first of three goals when he outwitted his marker Lindner. The hosts' high-tempo game suited the East Germans poorly, and even if the penalty had been a wrong decision by the referee, Polster comfortably tucked it away for 2-0. Thom won GDR a stone wall penalty in return, though Steinmann failed to convert as Lindenberger saved well. East Germany made a substitution before the break to try and bring some desire into their play, but they continued to be lifeless throughout, and their second-best performance got what it deserved when Polster finished low diagonally on the hour for his and Austria's third. Added with the outcome in Simferopol, the hosts could start their World Cup preparations. The group was alive until the very last day of qualification, where both matches would impact on the final table. Ultimately, it was the favourites who came through as group winners: The Soviet Union never really impressed too much, albeit there was a certain level of solidness defensively about them. They had given some evidence of their ability to break with pace, but altogether they had been disappointing going forward, something which the scant return of 11 goals from eight matches serves as proof of. It had remained unknown who would progress through to the World Cup alongside the group favourites and top ranked Soviet Union, and through their excellent round-off against an unfocused East German side, Austria made sure to qualify courtesy of a Toni Polster hat-trick. The Austrians had found goals difficult to come by, with only six from their opening seven matches. When it mattered the most, their only foreign legionnaire proved his worth. However, they still needed the Soviets to avoid defeat at home to an often impressive Turkish outfit to win through. Turkey had turned in some of the best displays in the group, most notably when they had brushed past both GDR and Austria at home. Unfortunately, they had failed when it mattered, losing 2-1 to an already knocked-out Iceland, who finally won their first qualifier at the final attempt. Iceland, through drawing a whole lot of games, were also in contention until late in the qualification, before a 2-1 defeat in Austria made sure they were left without a chance of qualifying after their penultimate match. East Germany had been second seeds, but they failed badly after losing three successive matches once they'd won against Iceland in their opener. They would be playing under three different managers, and they never had a truly settled team. However, a revival under Dynamo Dresden manager Eduard Geyer still saw them challenge until the final day of the qualification, although they were never anything else than second best in the crunch game in Vienna. Domestic events in the days leading up to the game in Austria had made sure to take their concentration away from the game, and there were in the aftermath rumours of some of their players even being tapped up whilst the game in Vienna was going on!